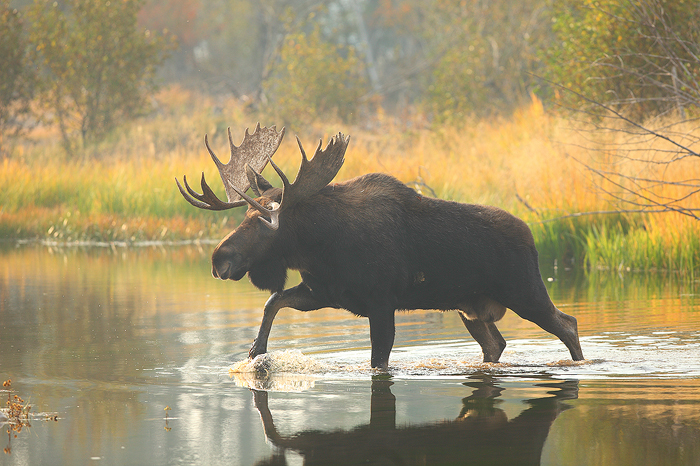 A large bull moose crosses a small pond on a perfect autumn day. Two cow moose and a calf spent the morning feeding on the aquatic vegetation in the water. The male moose spent the morning pacing up and down the area where his harem was feeding, calling out to any potential competition that might be in his area. There's no time to slow down and eat for a bull moose this time of year. The rut is in full swing and maintaining his harem is a full time job.